When I first logged on to Facebook in 2004 none of my real life friends had accounts yet. At that stage in the social networking site's development, a Facebook account was only for university students (or at least anyone with a university email account). I was working at a campus Hillel and my .edu email address gave me access to Facebook so I could interface with the Jewish students on campus. At that time it was mostly undergrads who were poking each other, updating their status, and uploading photos to Facebook. As the years went by, Facebook welcomed young adults and then high school students. The non-student users seemed to get older and older until one Baby Boomer must have finally unlocked the Facebook door and told a few friends about it. Before you knew it -- urgh! -- Mom and Dad were uploading profile pics and stalking the neighbors' pages. You can't blame Mark Zuckerberg for transitioning the site from Ivy Leaguer college kids to anyone in the free world with a pulse. After all, you can't get to 550 million users without welcoming the Gen X'ers, emptynesters, and Medicare recipients, right? So, it was only a matter of time until the generation that actually remembers Prohibition started getting Facebook accounts. Over the past few years I've gotten used to the "friend" requests from my parents' cadre of friends. But when I was "friended" by my wife's 90-year-old grandmother's friend last week, I did a double-take. This 80-year-old woman didn't just set up a Facebook page; she's a power user. She's uploaded dozens of photo albums (something my parents' friends haven't figured out yet), joined groups, and commented on everything. She's even got a blog and a website ("The Bubbinator.com" -- I'm not kidding!) with embedded YouTube videos of her telling Jewish jokes. Based on the latest stats, I shouldn't be surprised about this. According to the Pew Internet and American Life Project "Generations 2010" study, the fastest growth in social networking usage "has come from internet users 74 and older: social network site usage for this oldest cohort has quadrupled since 2008, from 4% to 16%." These great-grandparents, many of whom spent the majority of their lives without a home computer, are now using the Internet to seek health information, reconnect with friends and family, and purchase products. Facebook has even had to adjust to this new demographic storming the site. "Widowed" was certainly not a relationship option when Facebook first launched; and "It's Complicated" just doesn't fully describe when your husband of 55 years has passed away. It could be that Granny realized the best way to stay connected to her children, grandchildren, and even great-grandchildren was to meet them where they are -- in Cyberspace. So don't be surprised if your News Feed lets you know that Zaydie likes Big Band Music or your Bubbie just blogged her favorite quiche recipe. 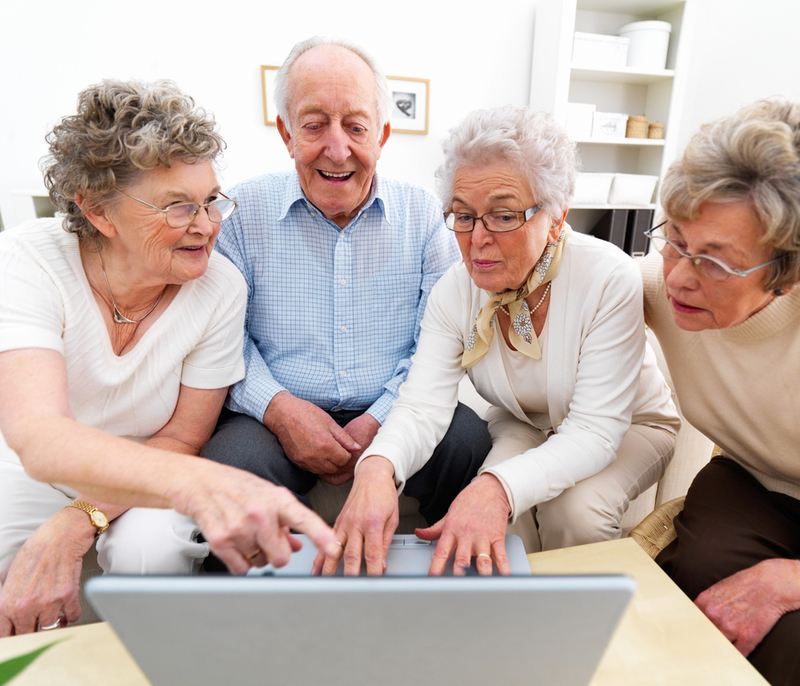 The senior citizens have entered the cloud! Now if I can get everyone at CAI thinking along these lines I might be on to something!